Then I started making loops of seed beads over each of those base beads. I started using only black in the first rows and then sprinkled in just a few of the dark charcoal color, letting the colors blend. As those ran lower, I added in a few of the next lighter shade of gray and continued all the way across the base until my last rows were pure white. In the end, I couldn't be more pleased with this bracelet. I love the weight of it, both visually and the weight of it on the wrist is lovely. The loops add lots of subtle movement and the color gradient is exactly what I wanted. I think I may have to attempt another one of these - maybe next time in teal! If you enjoyed this week's Year Of Jewelry piece, I hope you will take time to check out the previous ones: Week 1 Renewal, Week 2 Grace, and Week 3 Music. This is gorgeous as always! Have always been a fan of ombre. When I saw your clasp button choices, my first thought was the coral/red one too - but I think your results are perfect when I see the finished piece. I can only imagine how good this piece must feel to wear. It probably 'swishes' a little too. Fabulous! Very classic style, Sherri. Your button dilemma has me wondering... is there any way to have an interchangeable button system, you know, like when we add buttons to a garment and want them removable: the fashion button is joined to a smaller plain button with a length of thread and buttonholes are used on both fabric pieces. Usually done for laundering purposes, but could be cool to use in bracelets, too! I tried to think of a way to make the button interchangeable - I though of putting a small lobster clasp on the end of the bracelet that could go through the shank of the button or something. But then you also have to make sure the buttons are exactly the same size so the loop will fit. I think the idea has merit, but I couldn't quite refine it. The possibilities with this are endless! The button was the right choice, the red one would have taken away from the bracelet itself. What a fabulous bracelet!! 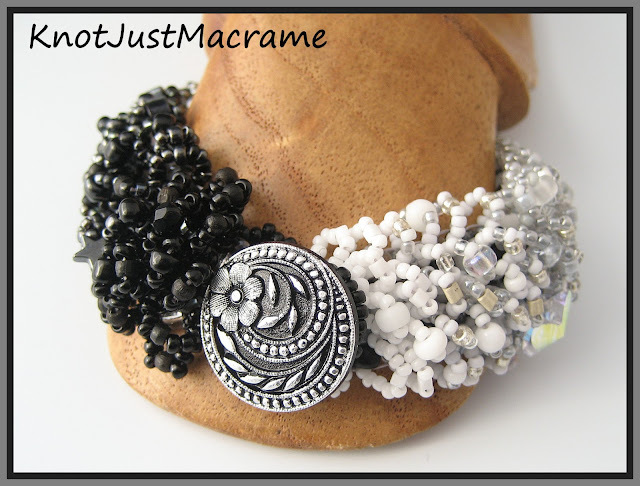 I love making this type of bracelet but would never have thought of doing it ombre what a brilliant idea!! !